Like many groups who disappeared for decades, only to resurface a generation later, beloved British sensation The Zombies might be hard to keep up with. Muddied further by decades of imposer acts trying to play under their name, the band, who initially broke up in 1967, reunited intermittently in the ’90s, and have been in full reunion mode since the mid-2000s, helmed by core duo Rod Argent and Colin Blunstone, despite the fact that all but one other member of the original five-person lineup are still around. A decade ago, the full group (completed by Chris White and Hugh Grundy) finally came together for the anniversary of their posthumous sophomore album, Odessey & Oracle, performing it live for the first time ever. In 2015, the original lineup once again brought O&O to life, and that celebration has extended to another (and supposedly final) run of shows this year, including an April 9 outing at TPAC’s James K. Polk Theater. A rare chance to see a legendary and short-lived band in their most whole form, not to mention a celebration of an album even fans in the ’60s didn’t get to see live, this will surely be an unforgettable night of rock history. You can still grab tickets right here, but we’re also thrilled to announce that we’re giving away a pair of tickets to one lucky fan! Read on for more about The Zombies, and enter for a chance to win below! A short-lived but seminal part of the British invasion of rock groups that swept America in the 1960s, St Albans psychedelic/baroque pop band The Zombies have the distinction of being the second U.K. group to hit #1 in America, after The Beatles. Best known for the hits “She’s Not There,” “Tell Her No,” and “Time of the Season” (if you’re not sure whether you’re familiar with The Zombies, just listen to any one of those to confirm that yes, you definitely are), the band only released one proper album, 1965’s The Zombies (called Begin Here in the U.K.) before abruptly disbanding in 1967, just five years into their run. The Zombies’ posthumous 1968 sophomore effort, Odessey & Oracle, which they completed before calling it quits (much like The Beatles with Let It Be), would go on to achieve rave reviews, and would spawn their most commercially successful (and at least second best known) single, “Time of the Season,” despite never being played live for fans. In the wake of the group’s demise, many imposer bands using the name popped up over the years to meet public demand (much to the real Zombies’ annoyance), though they largely resisted any immediate offers to reunite, going on to launch successful new projects throughout the ’70s and ’80s. A brief ’91 partial reunion took place and resulted in an album, though it’s largely ignored, and was reportedly only staged to reassert claim to their band name. In 1997, however, the group’s full lineup reconvened to perform for the first time in two decades in celebration of a new box set, and just a few years later, vocalist Colin Blunstone and organist Rod Argent, the core duo behind the band’s songwriting, reclaimed the name with a new rhythm section, and have since released three new albums under the Zombies moniker, most recently 2015’s Still Got That Hunger. The Blunstone/Argent version of the The Zombies, which, as far as reunions go, is a pretty fine lineup, have been touring actively for more than a decade, and have passed through Nashville regularly in recent years. However, The Zombies playing this TPAC show are different- for the fist time since a brief run in 2008 and 2009, where they first played Odessey & Oracle in full for its 40th anniversary (which they also filmed for a DVD), the group will feature bassist Chris White and drummer Hugh Grundy (4/5 of the original lineup- sadly, guitarist Paul Atkinson passed away in ’04), again to celebrate their landmark sophomore album (it turns 50 next year, but this year is the 50th anniversary of its recording, and the Zombies’ original disbandment). Once this leg is over, the band will presumably revert to the Blunstone/Argent only version, so not only is this a chance to see every surviving member of this legendary group together, but also a celebration of an album rarely heard live for the last half a century. If you need any more conniving, just hit play on the video below, and imagine the song meticulously created by the artists who made it. Don’t pass this one up! Winner will be announced Friday, April 7 at 12 p.m. CDT, and will receive one pair of tickets. Good luck! Win Tix to The Zombies at TPAC! 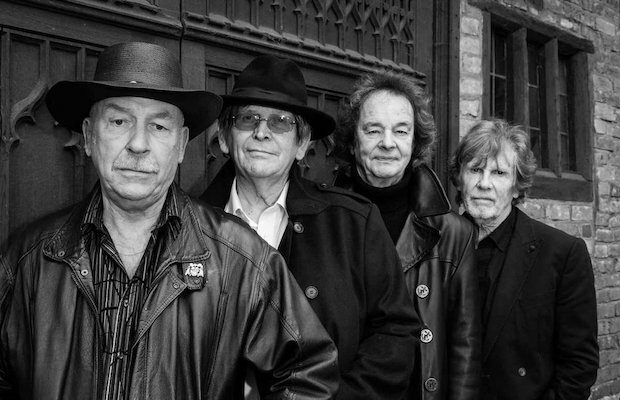 The Zombies will perform Sunday, April 9 at TPAC’s James K. Polk Theater. The show is all ages, begins at 7 p.m., and tickets are available to purchase for $35-190.